When to use an epoxy floor primer is a subject that is often overlooked by the average home owner who is investing in a premium garage floor coating. In fact, many people aren’t aware that they exist or think that it’s just an added cost by the manufacturer or vendor that they don’t need. Epoxy primers provide an abundance of benefits for your coating, with some specializing in problems associated with the surface of the concrete itself. With exception to the inexpensive one-coat epoxy paint kits, if you want to insure that you achieve the best possible adhesion and endurance of your garage flooring for years to come, then you should seriously consider the use of an epoxy primer for your floor. The benefits of using an epoxy floor primer for your garage are many. Let’s take a quick look at these to get a better understanding of what they do. Epoxy primers are thin and provide for better adhesion because they penetrate into the concrete substrate for a better bond. Primers provide for a better chemical bond of the thicker epoxy base coat which results in a longer lasting and more durable garage floor coating. Because of their thinner nature, epoxy primers help to eliminate bubbles and pinholes that can form due to outgassing of the concrete. They allow for the subsequent base coat to achieve a higher dry film thickness and coating uniformity since it is not soaking into the concrete. Some epoxy primers are effective in providing a moisture barrier for garage floors that have light moisture problems such as efflorescence. Most are moisture tolerant and work well when being applied in high humidity areas of the country or concrete that has not fully dried from being cleaned or acid etched. Some are specialized such as oil blocking primers. These are solvent based primers made to cover concrete that has been contaminated by oil and can’t be completely cleaned. Epoxy adheres to concrete by forming a mechanical bond within the pores of the surface. This is why you need to profile the surface by either etching or grinding the concrete. Primers are designed to penetrate deeper into the pores in order to achieve a better mechanical bond. This reduces any chances of delamination of a properly prepared surface. The primer also produces a thinner epoxy film or tie coat that the much thicker base coat can chemically fuse with. This process produces a much stronger bond of the base coat and is why most contractors always use a primer. 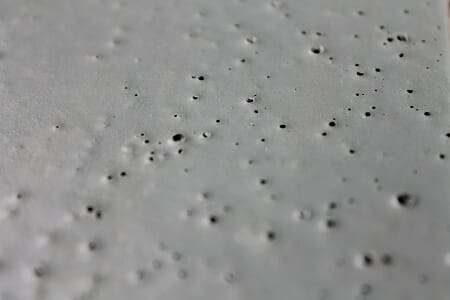 Air bubbles, craters, and pinholes can be created in epoxy from outgassing of the concrete. Air in the slab will rise due to a temperature increase or change in humidity. 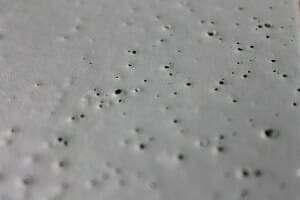 If this happens during the initial application and curing process of a high solids or 100% solids epoxy to bare concrete, it can form these bubbles, craters, or pinholes when the air escapes the concrete. As a side note, these bubbles can also happen due to poor mixing of the epoxy or improper back rolling. Because of their thinner film, epoxy primers reduce the likelihood of bubbles and pinholes forming. They do this as they soak farther down into the concrete to fill the voids that can hold air and reduce the chances of air finding its way to the surface. If air does find it’s way to the surface, the bubble will usually pop and then slowly fill back in before curing due to the low viscosity of the epoxy primer. Since most epoxy primers are water based, the chemical makeup provides for moisture tolerance as well. As a result, some brands can actually be applied to a damp slab. This is beneficial for the DIY epoxy installation that profiles the slab with acid etching. Instead of waiting 24 -48 hours or more for the slab to dry completely, you can apply your primer when the concrete is still damp or if the humidity is up. Many of these same primers will also form a vapor barrier to ward off the problems associated with moisture that tries to work its way to the surface. If you think you have a moisture problem, contact the manufacturer first to determine how much moisture you can have in order to use their product. Finally there is epoxy primer for those who thought they could not epoxy coat their garage because of oil contamination that could not be removed completely. Some manufacturers make an oil stop primer that is solvent based and works by actively seeking out and bonding to the oil contaminants embedded in the concrete. These are usually dark in color, however, and need to be covered with more than one base color coat or with a full refusal paint chip application. If not, the darker color may bleed through and alter the color coat. Will your epoxy floor coating fail without a primer? No, if you prepped your floor correctly, chances are your coating will not fail. However, with all the benefits that can be gained from using an epoxy floor primer, it’s hard to come up with an excuse not to. They are definitely something to strongly consider and most cost less than the high solids epoxy formulas due to their thinner film thickness. If you are going to spend the money for a commercial quality, high solids garage floor coating, then it’s well worth the few dollars more for an epoxy primer. It will help to provide the most durable and trouble free coating that you can have for your garage and the investment will provide a great return for years to come. We have been receiving numerous questions regarding the use of an epoxy primer for the single coat DIY garage floor kits that you can find at most home improvement centers. Some of these include but are not limited to, Rust-Oleum EpoxyShield, Valspar, Quikrete, and RockSolid floor coatings. With the exception to RockSolid, these kits are low solids epoxy with a low viscosity. In other words, they are a thinner coating. They do a good job of penetrating the concrete already. While RockSolid is a higher solids coating with a higher viscosity than some other DIY epoxy kits, the Polycuramine formula does an excellent job of penetrating the concrete like the other brands. While epoxy primers are typically a lower solids water based coating, they cost just as much or more than the typical DIY single coat kits and they are of a higher quality. The performance and durability of the typical epoxy primer is better than most of the DIY home improvement garage floor kits as well. If you are concerned about the benefits of a primer, you are much better off applying two coats of the DIY kits versus one coat. The second coat will allow for a thicker coating with much better color uniformity. It will also provide the opportunity to cover any cosmetic defects in the first coat that can be caused from environmental conditions in the substrate and application errors. I will be using Armorseal 8100 for my car garage, do you recommend applying primer? If so, what do you recommend from Sherwin Williams? Hello Jose. The Armorseal 8100 is a low solids, water-based epoxy. The consistency is similar to that as the home improvement DIY kits, but a better quality. Because it’s a thin coating you do not need an epoxy primer. In fact, most epoxy primers are a higher solids product than the ArmorSeal. Instead, we would recommend that you apply two coats. The first would act as the primer coat. You would let the first coat fully dry. Then apply another coat. How long would you wait before putting on the first coat? Hi Philip. You need to wait approximately 10-12 hours after applying the epoxy primer coat before applying the base color coat. If you wait longer than 24 hours, you will need to rough up the surface first as the next coat will not be able to bond chemically. Just as a precautionary note, do not confuse an epoxy primer coating with latex concrete priming paint. I am building a house and wish to seal the garage floor. The floor was poured about 7 months ago. They put down a bed of gravel, then a moisture barrier and then the concrete. I have a guy who is going to install the sealer, but he is reluctant to do so, because the moisture level of the concrete is over 6% in some areas. I did the plastic sheet test and see no moisture coming out of the concrete, so it looks like the concern is the actual moisture content of the concrete. I don’t know what product he uses, but do you think it would be safe to seal this slab, or should he use an epoxy primer first? He said there is a primer he can use, but he thinks it will add about $1000 in cost to use it for this 400 sq ft slab. Thank you! Is it a decorative coating that you want to apply or just a sealer for the concrete? What type of primer is recommended for a newly poured slab (3 months old) to use with Rustoleum Rock Solid Metallic Garage kit? Hi Bob. RockSolid does not require a primer for their product. Like other home improvement store garage floor coating kits, it is a relatively thin coating that penetrates well on its own. While I note your comment that a primer is not required, I’ve seen videos where bubbles and other imperfections still show up with the Rock solid metallic kits. Will a primer help to alleviate this? Can it still be beneficial and using an epoxy primer cause other problems? Hello Felicia. The reason you are reading about bubbles has to do with not letting the garage floor dry long enough or from rolling it on too quick/aggressively. Other cosmetic issues have to do with porous concrete, stretching the coverage rate, and the fact that RockSolid it a bit thin to begin with. An epoxy primer would help to alleviate these issues and build a thick overall coating, but it will require more work. RockSolid is a proprietary blend of polycuramine that has not been tested with chemical adhesion to epoxy. It most likely would adhere well, but you would be taking a chance. What you would need to do is let the epoxy primer cure for 48 hours, rough it up with 120 grit sandpaper, and then apply the RockSolid to ensure a good mechanical bond instead. An epoxy primer is actually thicker than RockSolid, less expensive per square foot, and provides better protection. If you were going to go this route, we would recommend not applying the RockSolid over it and instead apply a high solids epoxy over the primer for a much thicker and longer lasting system. Other than a real glossy coat, it doesn’t make sense to apply an inferior coating (RockSolid) over a better one (primer). Want to seal a 50 year old garage floor in Vermont. Has significant water that rises through the floor. Also do to age and years of moisture, the concrete is heavily “pocked/worn in many places. Any thoughts? Hi Steve. The first thing that should be done is to make sure all preventative measures have been taken to keep moisture from getting under the slab to begin with. Examples are making sure water drains away from the slab and does not collect against it, downspouts are directed away, and etc. If the slab is below grade, sometimes there is only so much that can be done. Next, you would need to clean the concrete and then treat the slab to a densifier or penetrating sealer that is used for basements. These products react with the concrete to fill the pores and help slow down and sometimes stop moisture. This is an example of a densifier. After that, you can fill all the pitted areas with the appropriate repair material. This article has more information about that. After that you can conduct a moisture test to see where you are at with the moisture issue. The results you get from that will determine what more (if any) can be done with your floor. Coatings will seal the concrete, but they cannot be applied if you have moisture issues or the coating will eventually peel from the concrete deteriorating underneath. The exceptions are special moisture blocking concrete epoxy primers, but it all depends on how much moisture the concrete is emitting. I loved the article about epoxy primers. What I did not find after spending hours at home depot w no luck is what are the best epoxy concreteprimers and Where do I get them. I’m doing about 3,000 sq ft and to prime the concrete first before I apply Epoxy Tech Epoxy. Any recommendations would be very appreciated. Hello Bryan. You will not find an epoxy primer at a home improvement center. You will only find them from concrete coating specialists and vendors. Home improvement centers do not want the hassle of dealing with commercial types of coatings with the DIY market. They want something simple, easy, and cheap. Legacy Industrial is a good example of where you can find quality epoxy primers. Thanks for the response. I checked out legacy industrial and was wondering it “lock Down Concrete Bonding Primer” would be suitable as well? Its price per gallon is much more affordable. Since I need to purchase a large quantity if this is also a suitable primer for epoxy would this work? No, Lock-Down bonding primer is an acrylic latex concrete paint. It is not an epoxy, nor is it compatible. It will not adhere as well as epoxy does to concrete and epoxy will not chemically bond to it during the recoat period. An epoxy primer is a specially formulated epoxy that is less viscous than high solids epoxy. It is designed to penetrate deeper into the concrete and allow any entrapped air within the concrete to escape. Thank you very much. Was hoping to find a primer for my application that isn’t $90 per gallon since we are on a tight budget and hoping there is the right epoxy primer that is really good for less. If you have any other known more affordable primers I am open to additional recommendations. Hi Bryan. Unfortunately most decent epoxy primers are all within a few dollars or so of that price. Legacy Industrial is one of the few that endorses its use with other brands. I started the process of installing an epoxy garage floor (275sqft) in a MW 75 yr old home. After grinding, I plan to use 3 layers: epoxy primer, epoxy color and polyurethane top-coat. Because of surface moisture late winter/early spring (likely more from below than from above), I’ve been heavily researching epoxy primer products. Those sold as “vapor barrier” are too expensive but I’m concerned that a “standard” epoxy primer wont be effective. Q1. Is there a significant difference b/t the standard epoxy primer vs those sold as vapor barriers? Q2. Are you familiar with the product below &/or can you recommend an equivalent I might find at a local contractors supply store? VAPOR-STOP PRIMER, “…..a 100% solids pigmented epoxy sealer designed for use over concrete floors to eliminate moisture vapor emissions and increase adhesion of subsequently applied systems.” The 1.5 gal kit sells for $132 on garagecoatings.com which seems “relatively” economical given a coverage rate of 250-400sqft. THANK YOU! You are correct to worry about an epoxy primer not being effective, Matt. They are not designed as moisture barriers. The key to effectively blocking moisture successfully is to know your true moisture vapor emission rate. Without knowing for sure, you are just guessing at which product is best for your needs. The Vapor-Stop primer is a good product for up to 15lbs. There are other products that block moisture up to 20lbs. However, it doesn’t make any difference if your transmission rates are higher than that. How wet does the floor get? Keep in mind that you do not need to apply an epoxy primer over a moisture vapor blocking product as it will act as a primer as well. Lastly, moisture vapor blocking products require a good grind in order to sink deep into the concrete and adhere well. On top of grinding, I’ve completed two additional preventative measures : 1) sealed all “known” water access points around the garage and 2) performed CaCl moisture test yielding 1.7 lbs moisture emission. Recognizing 1.7 lbs is a conservative value (dry/July) – I’m making a “5X” assumption (wet/winter) which increases the result to 8.5 lbs or 5.5 lbs over the maximum value stated by Taylor Tools. Question: based on the above steps and test results, I’m wondering what class of product will make for the best, initial (preventative) layer: a “vapor stop” type epoxy primer 15-20 lbs – or – a densifier sealant product??? Thx!! Based on your readings, Matt, a moisture vapor blocking epoxy primer is by far the better solution over a densifier when applying a coating. The last thing you want to do is apply a densifer before applying moisture vapor blocking epoxy primer. If you do, it will require more grinding to provide an even rougher surface. The moisture vapor blocking epoxy needs to seep in to the concrete and not be blocked. I plan to use Rustoleum epoxy shield for my new 3 car garage floor. I already purchased two of the 2.5 car garage kits, knowing that most reviews say coverage is not always as advertised. I also have two of the gloss clear coat kits to apply after. Should I consider using an epoxy primer before the rustoleum to ensure better coverage and color? The article says “with the exception of one-coat kits”, but it’s not clear if there would be any problems associated with priming before a one-coat kit. Assume that the floor will be THOROUGHLY prepped. I plan MULTIPLE cycles of sanding, pressure washing, scrubbing, and muriatic acid etching before application of anything. Hello Mark. No, there is no need to use an epoxy primer for the one coat DIY epoxy paint kits. These kits are a lower solids epoxy like most epoxy primers are and generally get good penetration. Plus, most epoxy primers are slightly more expensive than the DIY epoxy paint kits due to their quality. It would make more sense to to just apply a second coat of the EpoxyShield if you like than to purchase an actual epoxy primer. I am moving into a new build home in mid October and plan to epoxy the unfinished side of my basement to keep down the dust etc. This website has been an amazing resource so I want to thank you. I have a walk out basement and two windows, however they are on the finished side of the basement. The area I want to cover is approx. 550 square feet with poor ventilation. I was trying to avoid acid etching due to the fumes and I would prefer to keep the acid from my furnace and pipes. Here is my plan, and I would love for you to shoot a hole in it if you think it’s not a good one. What weakness do you see here, any steps you would add? Do you think the Eco-Etch Pro with an epoxy primer will do enough to produce a quality job with the Epoxy-Coat? Thank you for your time and experience, like I mentioned this website is extremely helpful. Hi Jeremy. Yes, that’s a very good plan. Step 6 should be a requirement for most jobs. The one potential issue that was not mentioned is moisture. Where any steps taken to avoid moisture in the basement when the home was built? Most basements are below grade and many can have floors that develop moisture unless the slab was poured with a vapor barrier installed or the proper backfill material and drainage system constructed against the outside perimeter walls for moisture mitigation. Coatings do not fair well if moisture builds up under the coating and can lead to delamination issues later down the road. I know there is moisture mitigation around the perimeter of the home, however I do not know of a specific vapor barrier below the slab. Would you say in this case that an epoxy floor may not be my best course of action? I will be using the area quite a bit, work room, mancave type things, I just wanted something to cover the concrete to keep that dirty dusty aspect that bare concrete gives you. We can’t give you that answer for sure, Jeremy. Moisture mitigation around the perimeter can be very effective. However, if your area of the country gets a lot rain, there is the possibility that moisture could eventually work its way up under the slab. The products you are looking to use are excellent and will tolerate some moisture due to the use of the primer. You may never encounter any issues at all or you might at some point down the road. Is there any way to contact the builder and ask if a vapor barrier was installed? Another option would be interlocking tile flooring. They take abuse well and the substructure allows for air flow under the tiles. It is easy to install and the only concrete prep we would recommend is a penetrating sealer. Sealers are very inexpensive and easy to apply as well. Interlocking tile flooring would cost more, however. There is also the third option of applying the coating and if you do encounter moisture issues later on, you could apply interlocking flooring right over the top of the coating. I talked to one contractor who stated that he uses a 100% solids epoxy base coat but does not do a primer coat. He says he uses Sika and that the epoxy he uses is self-priming. What are your thoughts on this? Is there truly a self-priming option or should I find a different contractor that will include a primer coat? The reason some floor coating contractors use what they call “self priming 100% solids” is to save money on materials in order to compete with other floor coating companies. It also saves time and labor on installation. Sikafloor 216 is a 100% solids epoxy that can be used as a primer. However, it requires that it be applied much thinner in order to provide a proper priming base that adheres like it should. As a result, you lose the inherit build thickness when 100% solids is used on top of a primer coat. The overall floor thickness will be much less compared to other companies that use an epoxy primer and 100% solids base coat. We recommend that you contact a couple different companies and get quotes. We have an article here that discusses how to choose a floor coating contractor. First off, thank you for all of the helpful knowledge! I’ve learned a lot from this reply chain but still have a few questions of my own… I’m smitten with the look of metallic polycuramine DIY kits but am wary based on customer reviews of the product. Can you add metallic pigment to an epoxy primer and get the same result or are there more steps to be taken? I’d like to use a product with better coverage potential to minimize cost as the area I’d like to treat is a 900 sqft, 20-year old naked concrete garage floor. All guidance and any pointers are greatly appreciated. Thanks again! Hello Josh. The RockSolid or Rust-Oleum polycuramine metallic coating kits are an entry level type of metallic coating. For epoxy metallic coatings, they require that you use 100% solids epoxy for the metallics to work as they should. It also requires application of a dark epoxy primer first. Additionally, a high performance clear coat is highly recommended to protect the metallic coating from scratches and etc, especially for a garage environment. While these type of metallic coatings will perform much better and are approximately 3-4 times more thick, the materials required are going to be more expensive. I am trying to coat my restaurant kitchen floor. It has been there for 50+ years. We have had a moisture problem in the past but believe we have corrected it. We are going to grind down or etch the surface to take up the existing epoxy coating that did not hold very well. I have started to look at using a mobile polyurea company but I will be doing all of the prep work myself. What kind of primer do you recommend using if we are using a polyurea material as the finished product? Hello Michael. You will want to use a commercial quality epoxy primer coating. If there is a possibility of moisture becoming a problem, then you may want to consider a moisture vapor barrier epoxy primer. Though these are more expensive, they work quite well. Here is an example of where you can find such products. Grinding is the preferred method to prep concrete and the only way to properly remove an existing coating. Etching will have no effect. To be honest, most reputable floor coating companies are leery about applying their coatings to a floor that they did not prep themselves and will usually refuse the business or will put down in writing that they are not responsible for any problems that may occur with the coating afterwards. 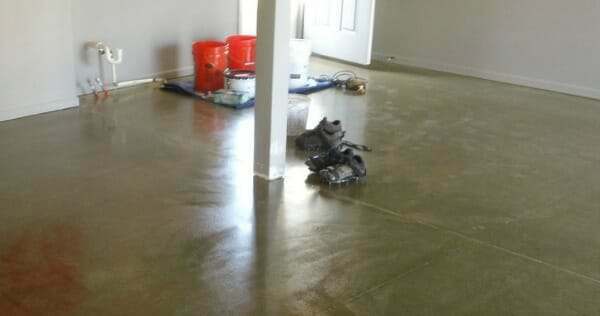 Were you planning on prepping the concrete, applying a primer, and then have them apply their coating? If so, they would have to apply their coating within 24 hours of you applying the primer. If the primer cures for longer than 24 hours, then it will need to be deglossed and roughed up properly before anything can be applied over it.